If you have an outdoor fire pit you going to need some tools. You will need to stoke the fire to get it re-ignited and such. You will need a scissor type of devise to pick up burning logs to re-adjust the fire. If you have a safety spark screen on your fire pit you will need a tool to open the hot door. Our most creative tool, ask for by many previous customers, is what we call our "PIT STICK". 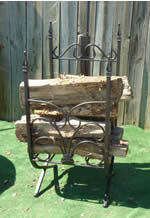 The "PIT STICK" is 48" long making it easy to use in any size fire pit. Our next tool is a stainless steel fire pit safety screen tool. It's made of 3/8" SS so it won't rust or fall apart.